This data set contains forest cover information for 2001 for all of South America. The data were collected by the MODIS sensor onboard the TERRA platform and released by the MODIS team as an image showing percent canopy cover. This information was then reclassified so that all pixels with a percent canopy cover greater than 40% (40% after the 1973 UNESCO standard) were classified as forest (a value of 1), and all other pixels were classified as non-forest (a value of 2). Water features were given a value of 3. This data has a pixel resolution of 500 meters and is unprojected with the WGS-1984 datum (Hansen et al. 2006). There is one GeoTIFF data file for this data set. Figure 1. Forest cover at 500 meter resolution of South America in 2001 derived from MODIS imagery. This data set was archived in December of 2011. Users who download the data between December 2011 and November 2016 must comply with the LBA Data and Publication Policy. The investigators were Walker, Robert T. and Jiaguo Qi. 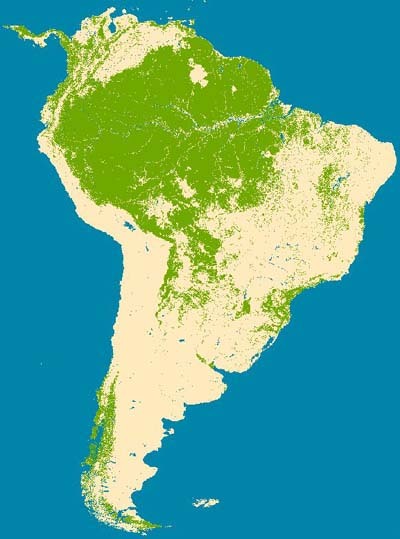 This data set contains forest cover information for 2001 for all of South America. The data were collected by the MODIS sensor onboard the TERRA platform and released by the MODIS team as an image showing percent canopy cover. This information was then reclassified so that all pixels with a percent canopy cover greater than 40% (40% after the 1973 UNESCO standard) were classified as forest (a value of 1), and all other pixels were classified as non-forest (a value of 2). Water features were given a value of 3. This data has a pixel resolution of 500 meters and is unprojected with the WGS-1984 datum. There is one GeoTIFF data file for this data set. There is one file with this data set: sa_forest2001.zip. When extrapolated, the zip file contains sa_forest2001.tif which is a map image, and sa_forest2001.tfw which contains information regarding the map such as location and scale. Spatial resolution is 0.004496603 degrees (500 m). The data set has been derived from MODIS VCF (Hansen et al. 2006). Data are unprojected with the WGS-1984 datum. The data were used for comparative land cover studies in the Amazon. The data were derived by reclassifying a MODIS image of percent forest cover into forest, non-forest and water classes. Accuracy and uncertainty was not reported for the original product from which the data was derived. The data were collected by the MODIS sensor onboard the TERRA platform and released by the MODIS team as an image showing percent canopy cover. This information was then reclassified so that all pixels with a fractional canopy cover greater than 0.40 (40% after the 1973 UNESCO standard) were classified as forest (a value of 1), and all other pixels were classified as non-forest (a value of 2). Water features were given a value of 3. This data has a pixel resolution of 500 meters and is unprojected with the WGS-1984 datum. Hansen, M., R. DeFries, J.R. Townshend, M. Carroll, C. Dimiceli, and R. Sohlberg (2006), Vegetation Continuous Fields MOD44B, 2001 Percent Tree Cover, Collection 4, University of Maryland, College Park, Maryland, 2001 [ http://www.glcf.umd.edu/data/vcf/ ]. Simmons, C., E.Y. Arima, S.P. Aldrich, and M.M. Caldas. 2007. Amazon Land Wars in the South of Para. Annals of the Association of American Geographers. 97(3). Aldrich, S., R. Walker, E. Arima, M. Caldas, J. Browder, and S. Perz. 2006. Land-Cover and Land-Use Change in the Brazilian Amazon: Smallholders, Ranchers, and Frontier Stratification. Economic Geography 82(3):265-288.